That must be the first moving cover art I've posted. I grabbed that off Scott Campbell's blog. 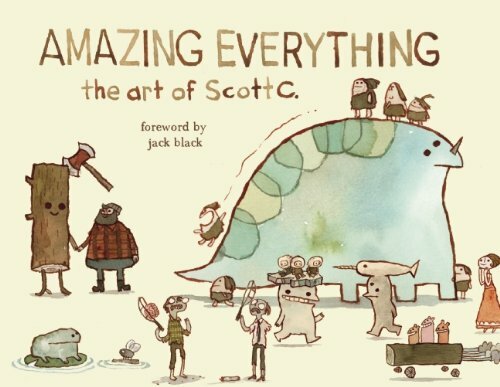 His new art book called Amazing Everything: The Art of Scott C. is now available. Collected within the pages are beautiful watercolour illustrations of all things cute and funny. You'll see references to pop culture, like the cult tree with iconic movie characters. Some are single panel of cuteness, like flying cavemen, stacked up sandwiched tanks. His larger pieces of work are more elaborate, like the home slices with silhouettes of objects, such as a tank, with a network of tunnels with amusing characters living inside. I like his use of watercolours that gives his work a very textured look. The colours are pastel, sometimes going to the earthly tones. The book's 128 pages, hardcover. This is an imaginative and amusing book. Recommended to those who like cute stuff and pop culture. Finally! Love his work but never could afford buying the individual prints. This will make for a great present to myself for Christmas.